So you want to go to a concert or game at Barclays Center? Find out about getting tickets. Where Can I See What's Happening at Barclays Center? Looking for the best place to get a calendar of concerts, games, and family events at Barclays Center? For upcoming events, visit BarclaysCenter.com or see Ticketmaster. How Much are Tickets to the Brooklyn Nets Games? In 2012, individual ticket prices for Nets games ranged from $55 to $175. What About Those $15 Tickets to Nets Games? “There will be 2,000 $15 seats at every Brooklyn Nets game, and 50% of Nets tickets will be $55 or less." Just how you get one of these cheap tickets remains to be seen. We are still seeking information; stay tuned. How Early Do Concert Tickets Go On Sale? There’s no specific timing as to how far in advance tickets go on sale at the Barclays Center. It varies by show. Can I Buy a Package or Season Ticket to Concerts at Barclays Center? All non-Nets events are sold on as individual tickets (no season plans). If you're buying the top tier All Access Pass, Brooklyn Nets season tickets, you get first rights to buy tickets for all other non-Nets events. Where Can I Buy Barclays Center Tickets? There are a lot of options in the ticket world. You can search online for various ticket sellers, though you'll probably pay more than if you bought directly from the venue. You can purchase directly from the Barclays Center Box Office, on Flatbush Avenue in Brooklyn. Tickets are also sold through Ticketmaster. 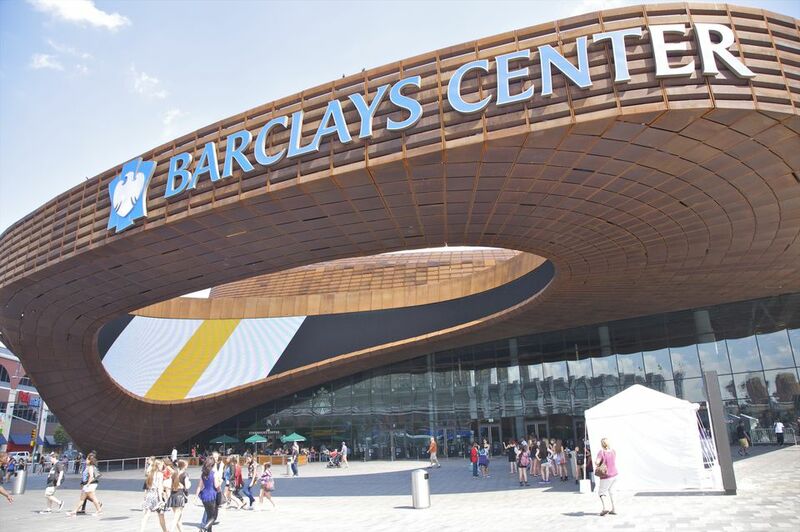 Get full-price ticket information from Barclays Center official website. Do Children Need Their Own Ticket? Do Kids Get In Free? For Sporting Events & "Most Concerts": Kids 2 years of age and younger do not require a ticket to be admitted into Barclays Center. But they must sit on adult’s lap and may not occupy a seat. Children age 3 and above need their own ticket to enter the arena and must occupy their ticketed seat only. The policy says, "Children up to 34” inches in height may enter Barclays Center free of charge but must share a seat with an accompanying ticketed adult." Each show’s setup is visible when you go to purchase tickets online. Seating charts are also available on the Nets website in a state-of-the-art 3D seating chart so you can "see" where you might sit using the 3-D seat gizmo on the venue's website. How Can I Get Advance Announcements of Concerts and Shows? Visit BarclaysCenter.com to sign up for Barclays Center Behind the Scenes newsletter and receive event updates, presale notices, and more. Follow @BarclaysCenter on Twitter and Facebook for the latest updates and special pre-sale offers.